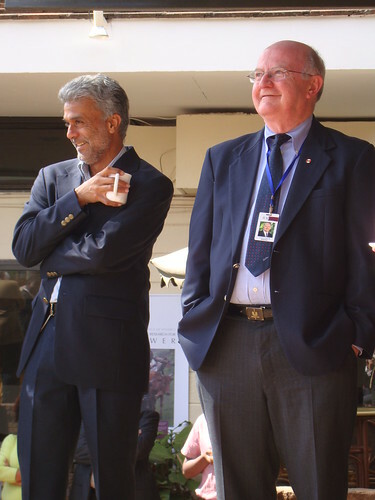 ILRI biotechnology director Vish Nene (left) and new ILRI board member Lorne Babiuk (right) at the November 2010 meeting of the ILRI Board of Trustees (photo credit: ILRI/MacMillan). Lorne Babiuk, a leader in Canadian vaccine research and vice-president for research at the University of Alberta, Canada, joined the board of trustees of the International Livestock Research Institute (ILRI) this month (November 2010), when he attended his first board meeting, held at ILRI’s headquarters, in Nairobi, Kenya. As vice-president of research, Babiuk facilitates the University of Alberta’s research, builds research consortia and strengthens the university’s international research links and collaborations. In 2010, the university opened the Li Ka Shing Institute of Virology, an institute created through a combined gift of $25-million from the Li Ka Shing (Canada) Foundation and $52.5-million from the Government of Alberta. The donation—the largest cash gift in the university’s history—will provide a state-of-the-art home to some of the world’s very best researchers in virus-based diseases. The new institute is working to attract significant private-sector collaboration with multinational pharmaceutical and life sciences companies. Since 2005, Babiuk has also served as principal investigator on a grant from the Bill and Melinda Gates ‘Grand Challenge in Global Health’ program, in which he and his team are developing vaccines against whooping cough (pertussis) in infants and young children, to be delivered in a single dose, without use of a needle. Children now need five doses of the vaccine to be fully protected and few children in the developing world get all the boosters. Babiuk also supports Albertan research initiatives such as the Pan Albertan Neuroscience Network. As vice-president, he established an annual event that celebrates the breadth and depth of the university’s research in all disciplines—from social sciences to the arts, humanities, medical, agricultural, natural sciences and engineering. He has consistently fostered research that crosses traditional disciplinary boundaries by, for example, supporting collaborations between social scientists and medical, agricultural and engineering researchers. And he helped develop the infrastructure needed by researchers in all fields to be more successful in individual and team grants. Before moving to the University of Alberta, Babiuk built up a research institute—the Vaccine and Infectious Disease Organization (VIDO), at the University of Saskatchewan—which became internationally recognized as a leader in new vaccine development. In 2005, he completed a US$19.4 million expansion of VIDO, and just before leaving VIDO, he assembled the funding needed to build a $140-million level-three bio-containment facility for work on infectious diseases. Earlier in his career, Babiuk was part of a research consortium that developed and began testing a vaccine for SARS (sever acute respiratory syndrome) within 18 months of its outbreak in Canada. In addition to SARS and whooping cough, Babiuk has led research into the herpes virus and the respiratory syncitial virus and created a vaccine against rotavirus in calves, which allowed researchers later to develop a vaccine for rotavirus in children. After completing a master’s degree in soil microbiology, Babiuk earned a PhD in virology from the University of British Columbia and a DSc from the University of Saskatchewan’s Department of Veterinary Microbiology. He has mentored over 90 graduate students and postdoctoral fellows and published over 500 peer-reviewed manuscripts and 100 book chapters or reviews. He holds 28 issued patents and has 18 patents pending.